Beau Geste Brand Vegetable Crate Label, Silberman & Gerst, Inc., Los Angeles, California. Image of Beau Geste in a Foreign Legion uniform blowing a trumpet. Beau Geste Brand Vegetable Crate Label. Vintage, unused crate label from Silberman & Gerst, Inc., Los Angeles, California. This original crate label the 1930s, measures 6.50 x 9.00 inches. 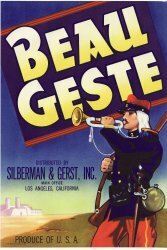 Image of Beau Geste in a Foreign Legion uniform blowing a trumpet. Shipped flat in a sturdy envelope. Ready to frame.